Now the price is $20, I just may have to try this plug-in. Does it play nice with Reality 2? You can have both of them installed at the same time, though. Help...Young teen Julie looks reddish brown. What am I doing wrong? I couldn't find a setting that works well with her skin. Maybe I accidental skipped over a good suggestion? edit: I would've let Luxrender run longer but it is getting late. Specular Color is way, way, way too high, I never use a value over about 50, and that gives an unrealistic really shiny surface if what you want is skin. Backface Specular should probably be turned right down as well. Do you have a bump map applied? For some reason, bump strength frequently comes in at full — and remember that number is in metres, not centimetres as in a plain 3Delight material. Use 0.001 (1 millimetre) as a start point and nudge it up and down a little from there until a test render looks OK. Lighting is a frequent cause of LuxRender weirdness. Are you letting a D|S light auto-convert, or setting up a light manually with LuxRender parameters? Can't help you with SSS settings, I haven't got as far as playing with that yet. I believe the strange redness is caused by the bump setting being to high, so do as SpottedKitty suggests and hit it with a nerf bat. I don't use Lux any more, but I remember having this problem when I first used Luxus. Turning down the specular strength and the Luxus bump map strength worked. Thanks. I didn't see those tips before. I am using lights that I converted to Luxus style lights using the dialog box. Now I just need to save the material preset and copy it to the dual-core Pentium. Not sure if this was covered before, but for the volume-based SSS to work, there's one key setting you need to keep in mind - opacity. 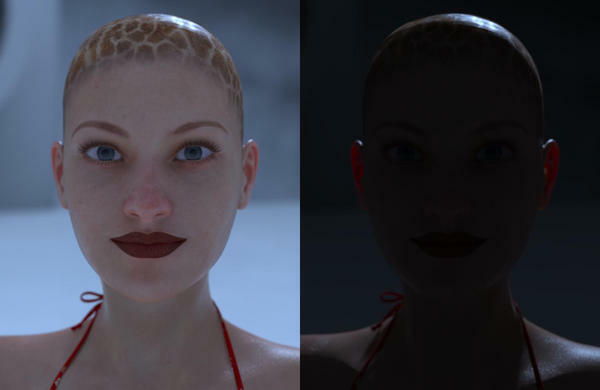 With opacity at 1.00 you won't get ANYTHING out of volume, as the "skin" over the volume will be 100% opaque. You need to bump it down a notch (0.9-1.0) to get some scatter through the volume. Better yet, make an SSS map (where black = SSS and white = no SSS, so inverse of the maps used in 3Delight), set the opacity to 0.85 or so, then assign it that texture map. 0.85 is QUITE transparent (for skin), but it will give you some leeway for painting in the SSS on very thin skin (nostrils, thinnest parts of ears, the very edge of the skin between the fingers etc.). Using the glossy material type in LuxRender, you are right SSS won't really show up. But that is not the complete answer. Opacity in LuxRender is not physically plausible. The first version(a preview to artists) of Luxus did not support it. Opacity was added because it is so familiar to users. I *was* talking about the glossytranslucent material. Try disabling the glossytranslucent's scattering. Then add volume material properties. 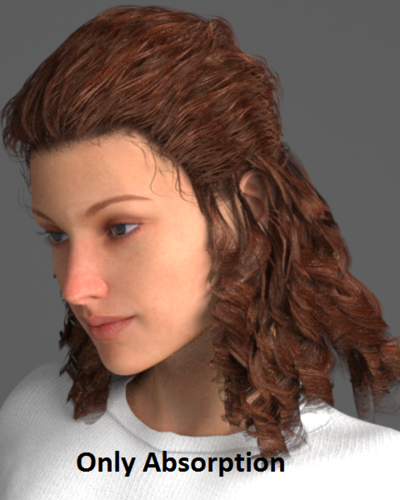 Set opacity to 1.00, add homogenous volume scattering. Now set opacity to 0.95. 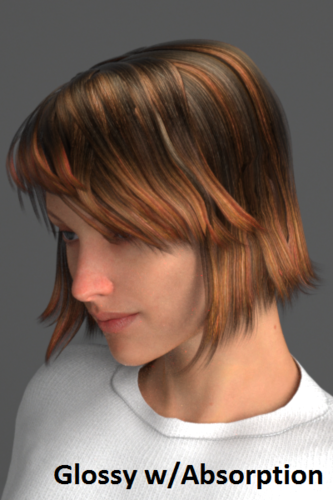 Yes, glossytranslucent does not require opacity for scattering, but if you want to do volume-based scatter, you will need to reduce opacity to get it to show up. Or, put it this way - having homogenous volume on with glossytranslucent makes no sense and yields no result (despite it being suggested somewhere at the beginning of this thread), unless you reduce opacity of glossytranslucent. You might say: "so what, that's physically accurate, using a control texture is only good for faking the physical response". - different tissues and materials can have different absorption and translucency in different areas, regardless of the thickness. - it's sometimes easier to "mask out" areas you *don't* want SSS in, if you find it distracting. Awesome thread...great resource for learning about Luxrender Materials (and Luxus' handling thereof). Huge thanks to all who have contributed, the diversity of approaches is fantastic. I downloaded Slosh's Luxus Skin file from ShareCG, and set about adapting it to V4/Lana. After a bunch of tweaking, I only got the Glossy Translucent material looking as good as the first example below. Had much better results switching to Glossy, with Michael_G's settings from post #184 (example on the right, below). I added a little bit of Absorption (depth: 0.4, color 32,77,102 - from Slosh's chart in post #151) to bring a little more color to the skin. I think this looks fantastic, especially considering a low-res texture like Lana, but would love some opinions from those with a more critical eye than mine. At this point, I don't think translucency is worth all the tweaking I'd have to do to get it looking anything other than weird. Let me know if I'm doing something obviously wrong, but at this point I'm ready to give up on it and stick with the (much simpler, easier) glossy material for skin. What were they? You might have come up with a fix for something that bites me every now and then (unexpectedly long until-it-looks-good times). I have an ongoing problem with grain as well. I stumbled, literally, across a tutorial a couple of days ago that was an online video, but being the doofus I am I forgot to bookmark it. Took me about five minutes to follow the video, and I had a very, very nice image in about five more. Wish I could find that video again. I've been reading through this thread and hope to learn more by observation, trial, and practice. Thank you to everyone who has contributed. 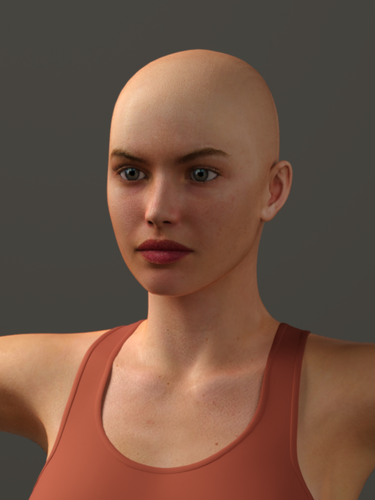 For the hair settings so far I've just been converting it to matte with a sigma of 90. Once or twice I've used car paint of all things, but I think the solution is glossy translucent though I haven't found the magic numbers as of yet. Without a specular map on the hair the glossy settings will make it look like a helmet. Here are the two examples with Matte Sigma 90 and then Glossy with essentially no glossy settings and an absorption color of RGB 16-65-128 and 0.5 absorption depth. The absorption color and the depth is really a matter of taste, but remember it is opposite of the color you want in the object. 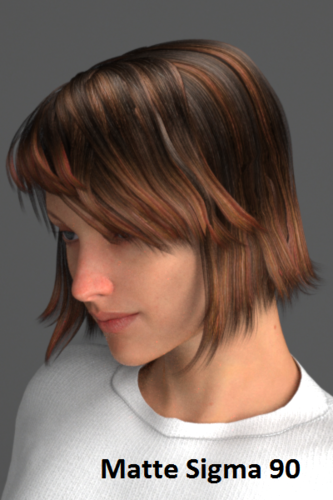 I'll try a hair with a specular map to see if I can get the glossy setting to have an acceptable restult. Pen Hair has speculars and here are the results. I had the glossy setting very high, but with a dark color. Personally I think the glossy setting isn't as important as the absorption, but can help if you are patient and test it. Glossy Spec Color 29-17-7 IOR 140 Roughness for both is .014. Hopefully this is useful to some of you. Got a question I can't seem to answer, and maybe I'm looking at it the wrong way. 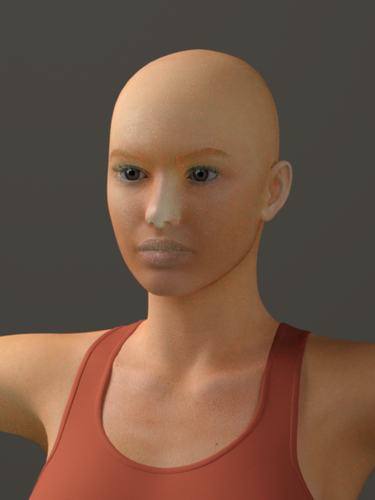 Is there any reason Luxus/Luxrender would override my skin settings after I save the daz project and open it the next day? 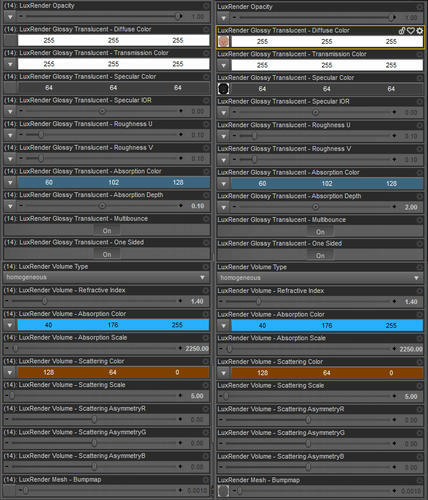 Yesterday I applied my glossy settings and saved the project wanting to dial them in today and now every time I do a render in lux it keeps pulling up the normal converted uber settings. There is still some work to do to make this Render better. But I lost patience. As it was requested in the Gallery, here are my settings. Added the lip settings too, to show where are the maps have been apllied and only at the lips a diffrent Glossy Translucent Absorbtion Depth Value was used.